"I took the Gazelle for an early morning ride out on the Palos Verdes Peninsula, one of the most beautiful cycling areas in the world. Lots of hills if you want, awesome views, and little traffic if you leave at the crack of dawn. 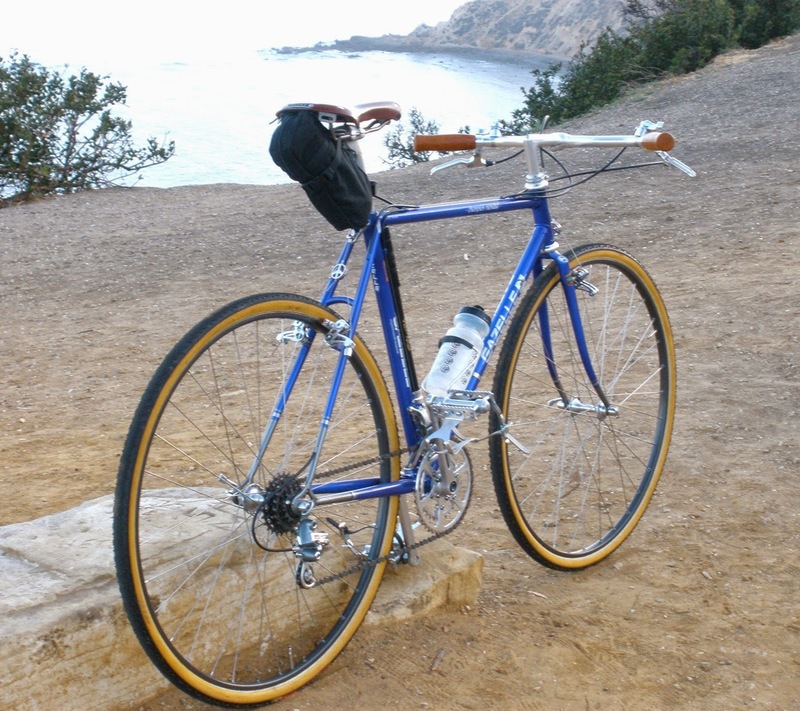 I wanted to put in a good ride in Palos Verdes to add what are to me relevant thoughts about the handling, climbing, and general mojo factor, which are admittedly subjective evaluations, but I know what I like and don't like in a bike. The 32 mm cross tubulars felt great in the dicey part of Portuguese Bend where the road is slowly shifting out to sea. Not as much cush as a wider high quality 650b tire but I felt totally secure. I won't ride any tire less than 28 mm up the coast anymore but most people out there on their carbon wonder machines are running 23s - I did for several decades. When standing up to sprint on a short incline the bike felt light on its feet, which is appreciated by a low wattage lightweight such as myself. The file tread of the cross tires is a little slower coasting but I am in no rush to get anywhere. I don't ride nearly as fast as I did when I was younger but I like a bike that feels like it surges forward when accelerating and in this regard the Gazelle shines. 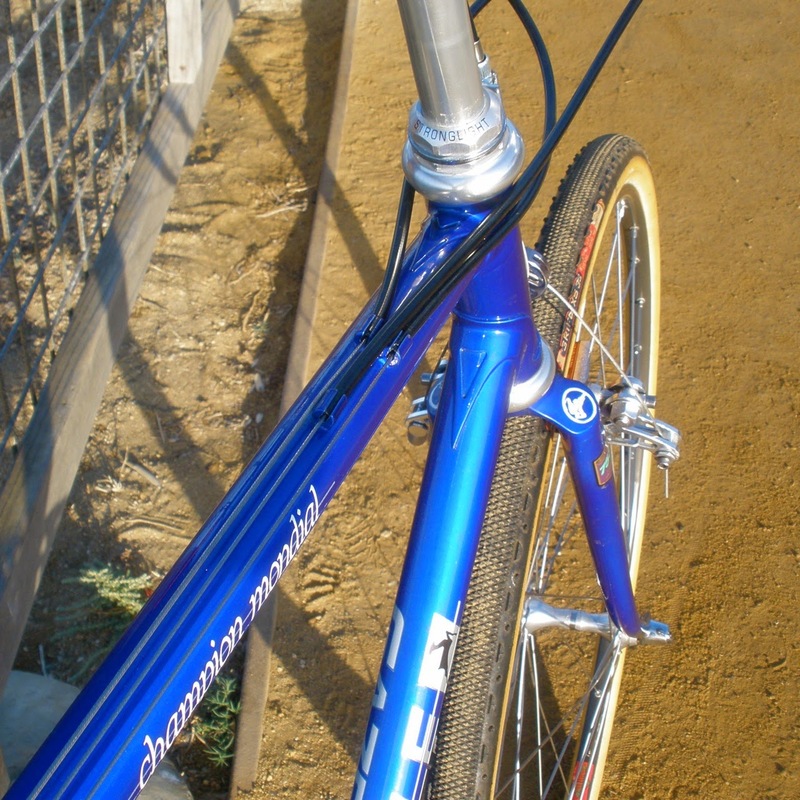 And of course visually a skinny tubed 80's cyclocross bike does look pretty cool. The main triangle of the frame, which is made of the previously mentioned Reynolds 753, is an odd mix of metric tubing for the top tube and seat tube (26 mm and 28 mm) and regular, English-sized tubing for the down tube (28.6 mm, which is 1 1/8"). 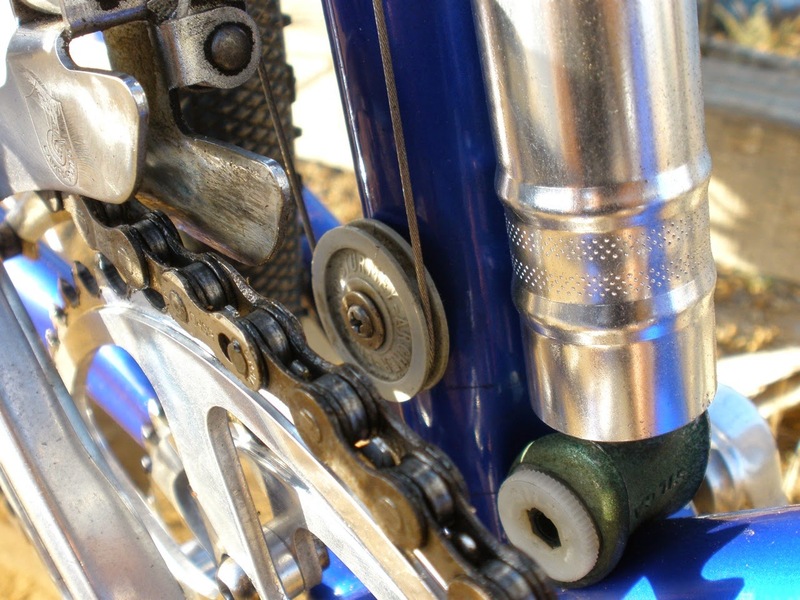 The lugs are Bocama Professional long point and it has a Cinelli bottom bracket shell. A little history on Reynolds 753 might be in order if anyone cares. In the '70s Reynolds, maker of the famous and ubiquitous 531 tubeset used for decades by countless European pros decided to come out with a lighter set of tubing for competition. Using the same basic Manganese Moly steel alloy, it was heat treated for extra strength. The extra strength meant it could be drawn with thinner, lighter walls, to save a whopping 4 to 8 ounces over a comparable 531 frame. Not only is that not much weight savings, but there were also some added complications when building with 753. Being heat treated, 753 tubes had to be low temperature silver brazed as opposed to the more common high temperature brass brazing, so as not to lose the temper of the steel and lose strength. 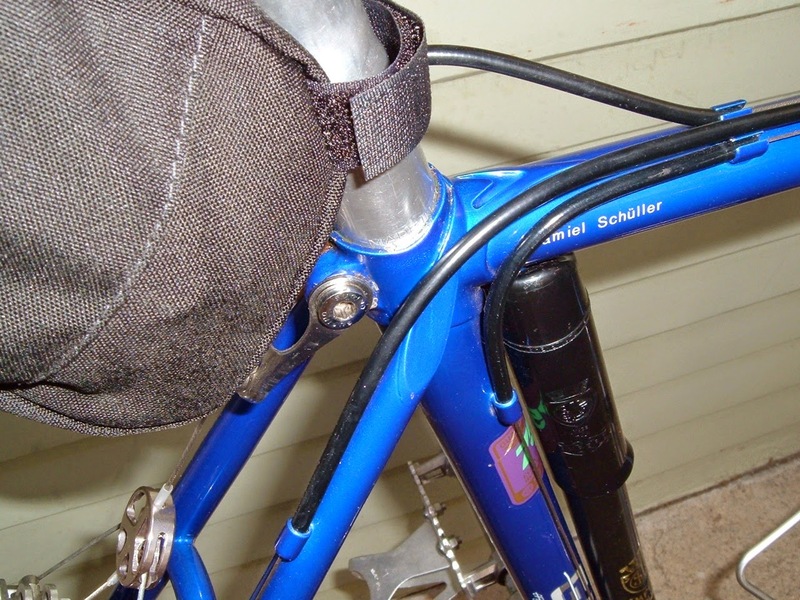 The tubing also did not like to be bent too much or it would buckle so the frame had to be built with great care with regards to alignment, as it could not be cold set (cold setting refers to basically bending and manhandling a frame into alignment after it was brazed). Reynolds would only provide the tubeset to someone who was certified to build using 753. The certification process entailed Reynolds sending a set of tubes and lugs to a builder who would braze up the tubes and send it back to Reynolds for inspection. This particular frame was likely built by Dutch 753 certified builder Jan Legrand who built frames for the 80's Dutch TI Raleigh professional team as well as 753 frames for Gazelle Nowdays there are modern steel alloys that can withstand heat (and actually get stronger when heated) that can have even thinner, lighter walls, and be TIG welded. Most of them have larger diameters that to my eye do not look properly proportioned in smaller fame sizes. They are also a bit stiffer which is a personal preference for some, but not mine. I am not sure if the Gazelle is a keeper just yet; it is kind of redundant for me as far as bikes go, since there isn't anything it can do that my Lyon doesn't do better I'm actually thinking about having a rotating "guest bike" - something not part of the permanent collection, that I can put together and ride for 6-12 months or so and then take apart and store away, and then reintroduce something else from the past. And regarding tubular tires, they are also known as "sewups", as many people (myself included) call them, especially in the US. "Tubular" is the more correct term so that is what I used here. They can be a little more work to install and a massive bummer if you get a flat early in their life, which fortunately does not happen too often, but they have a superior road feel over a comparably sized clincher. And they generally cost more but there are some very expensive high end clinchers out there now that arguably rival tubulars. The Pacenti 650b clincher tires I am using (sadly no longer made but there are some comparable and more expensive alternatives available) I would rate up there with a good sewup. And fatter, which is a huge plus. I have found that 650b tires (and wider tires in general) are no magic bullet, though - you still need to get high quality, supple, lightweight ones for their advantages to really be felt." Thanks, Jonsan, for a great guest blog post, and maybe we can talk you into doing another soon! To view the first post about this Gazelle, click here. "A couple of years back I started to recognize the benefits of tires wider than the 23 mm I had ridden for decades. I tried a touring bike, a fairly highly regarded one (Specialized Expedition), and it was yuck. I think the thicker walled tubing touring bikes have for carrying loads makes the bike feel sluggish when ridden unloaded. 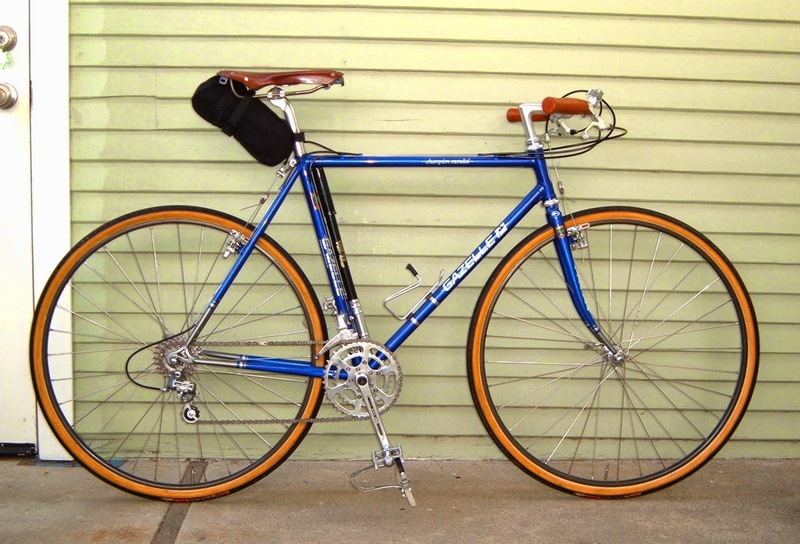 I wanted something a little racier, but vintage-y, so I started looking for a vintage cyclocross bike. Cyclocross bikes are all the rage now and easy to find but in the 70's and 80's they were pretty much unknown in this country except for a few brought in for a very small core of 'cross riders. The easiest ones to find (and still not that easy) were the Italian ALAN aluminum ones. I found one and was pretty stoked about it, but after I built it up and went for a few rides it also had to go. 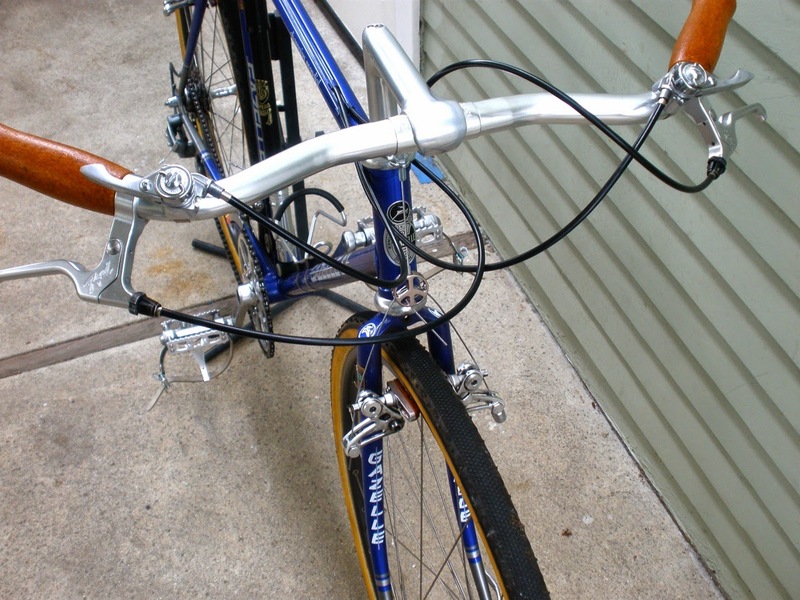 With powerful cantilever brakes, the aluminum fork would flex like crazy when braking hard, so much so that I was afraid it would eventually snap. You could literally see the fork blades flex back an inch when coming to a quick stop. I sold the ALAN and started looking. And kept looking. By some miracle I eventually found a Gazelle cyclocross frame, an ex race bike, that would fit me. The tubing is Reynolds 753 which was state of the art for its day and is the lightest steel frame I have ever owned. The serial number indicates it was made in 1984 but the decals are circa 1989. Apparently the rear dropout broke (presumably in a crash) and a new one was installed and the frame was repainted. Being a true cyclocross bike meant for racing, it has a high bottom bracket and no water bottle braze ons. Back then road racers ran 20-22 mm tubulars; this frame was designed around 28 mm cross tubulars which were considered wide back then, so it does not have the clearance of a modern frame. I ran it with 29 mm clinchers for awhile but after I acquired a Lyon frame, 29 mm tires didn't seem very wide anymore so I took the Gazelle apart and into the attic it went. I recently decided to give it another shot using 32 mm cyclocross tubulars; the rear wheel had to be moved back in the dropouts to gain enough clearance. I was originally running 39/44 chainrings which would be similar to what it originally had. In 'cross racing there is no need for super low gearing as it is faster to hop off the bike and shoulder it up a short steep incline rather than spinning a low gear. I rebuilt it with some of the parts off of a disassembled Bridgestone XO-1. The front derailleur has a braze on mount and I had to stick with a 44 large chainring as I couldn't lower the front mech any lower. I am using a 32 small chainring and I have to be careful when shifting the front as I have limited adjustment for the derailleur. With 32 mm tubulars at 45psi front and 50psi rear, it has a nice cush but still accelerates and climbs well. Without the pump and spare tire it is 20.5 pounds which ain't bad. I have a set of 30 mm road tubulars aging and someday will install them which should make the bike feel faster yet. I also need to install a stem 1 cm longer which will wait for another day when I can play musical stems." Click or tap on any photo in this post for a higher definition (larger) image. *Note - For those of us unfamiliar with tubular tires, Sheldon Brown's Bicycle Glossary defines them as: "A type of tire mainly used for racing. A tubular tire has no beads; instead, the two edges of the carcass are sewn together (hence the term "sew-up") with the inner tube inside. Tubulars fit only on special rims, where they are held on by cement." In Part 2, we'll take this vintage cyclocross bike out for a ride, and talk some more about this Gazelle and the Reynolds 753 tubing that it's constructed with. Stay tuned!